Built by D. & W. Henderson of Glasgow, the Anchor Line's second Columbia was launched in February 1902. Less than three months later, on 17 May, she began her maiden voyage from Glasgow to New York. 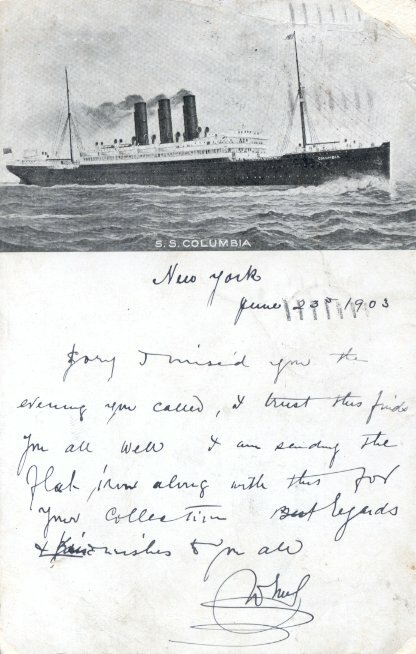 Remaining in commercial service for two months after World War I began, Columbia made her last commercial sailing in October 1914. She was then requisitioned for service as an armed merchant cruiser and was renamed Columbella so as not to be confused with the U.S.S. Columbia. The only survivor of Anchor's pre-war Glasgow-New York fleet, Columbia resumed commercial service in August 1919. She made her last Glasgow-New York trip for Anchor in August 1925. 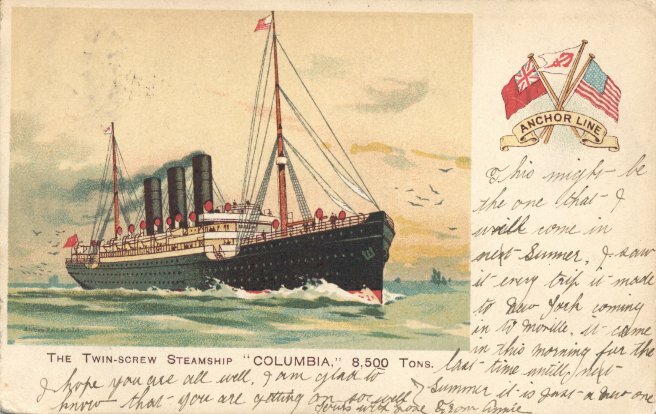 Columbia was sold to the Byron Steamship Co., a British-flag subsidiary of the National Greek Line, in 1926. Renamed Moreas, she was placed on Byron's Piraeus-New York service, but after only three trips between September 1926 and February 1927, she was laid up. She never sailed again, although ownership was transferred to the National Greek Line in 1928, and she was broken up at Venice in 1929. Sources: Bonsor's North Atlantic Seaway; Haws' Merchant Fleets; Morton Allan Directory.